You know me, I don’t like to brag. But there are some things you just can’t keep to yourself. It all started last Friday, when my wife, Linda, called to let me know there was water coming into our basement. The weather had been very cold for several days and then, suddenly, it switched to very warm. Plus, it was raining hard. With the ground still frozen solid, the water was pooling around the house. Some of it started leaking into the basement through a foundation crack. Not a river, but fast and steady enough that it was starting to spread across the concrete basement floor. Fortunately, Linda noticed it early. Unfortunately, the rain was still falling and the crack was still leaking. The only way to control it was to mop the floor every hour or so, since there’s no way to catch water in a container when it’s essentially just sweating off a wall. He removed his shoe lace, jammed it into the rock at the source of the leak, and put the other end into a bottle. As the lace got soaked, it dribbled a steady flow into the container. 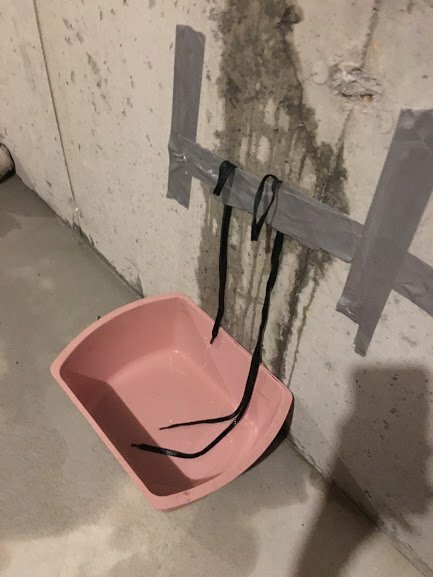 Fifteen minutes later (it should have been ten, but I spent the first five mansplaining my brilliance to Linda), I had successfully redirected the foundation leak away from the floor and into a bucket. So, does this make me a survival expert? I know one survival tip (well, two, if you count dialing 911) and it just happened to line up with an obscure real world problem. Bear knows hundreds. Maybe thousands. But does he know more than other trained survivalists? Probably not. The water-shoelace trick is likely known by all of them. The thing is, Bear’s show isn’t for them – it’s for survival idiots like me and you (I mean no disrespect). Which means that the content of his show must be simple, straightforward and, from a survival standpoint, not particularly groundbreaking. News to you and me; old hat to Bear and his peers. And you’re right, you don’t. Fortunately, your target audience is not one of your equally experienced and qualified peers. It’s the people who might one day hire you. People who, by definition, don’t (and never will) know anywhere near as much about what you do as you. When it comes to your profession, you’re Bear Grylls; they are a middle aged bald man with a leaky basement. I could talk all day about the advantages of email newsletters in particular and content creation more generally. In short, the more you do it, the more you benefit. But if what’s keeping you from starting is a concern that you don’t have enough to say that hasn’t been said before, you’re focused on the wrong metric. You don’t need new information. You just need to chop up your (endless) industry knowledge into little pieces, wrap it inside a leaky basement story here and there, and keep hitting the “publish” button. What animal do your survival skills bring to mind (“Bear” is already taken)? Don’t you think “Water-Seeping Rockface” would make a great band name? What kept (or is still keeping) you from launching an email newsletter? Brilliant as always, Michael, despite your pretensions of mediocrity. That’s another reason for me not to wear shoes with Velcro straps. Big, black, total-wrap-around sunglasses have also been banned in my Advanced Directive. Rockface? Nah. BUTCH! As in Cassidy: Leader of the Hole-in-the Wall gang. 2. Totally! Also Bucket Shoestring. 3. Nothing. I’ve been following your advice for years and years. I’m a writer, editor, and content strategist. My email newsletter currently is in the middle of series about the 5-step writing process, which is content I taught in college Writing 101 classes a thousand years ago–and which you and your readers probably mostly enduring in college Writing 101. But who remembers? I do. So I share what I know, and it blows away people who are not themselves writers, editors, content strategists, or former writing teachers. That is, completely unequipped to survive without someone else supplying food, water, a warm place to sleep, and maybe one of those whirly-wheel things. If one needs to pour some precious motor oil into an engine from one of those inherently gurgling plastic quart bottles – for which I suspect someone already secured the critical patent many years ago – place a disposable straw into the engine opening and pour the oil down it and see how much easier it is and how most of the oil seems to make it into the engine and not serve as a pleasant coating on the valve cover. What’s at work here is the same MKBN Principle as demonstrated with the shoelaces. Technical question: Do you put the straw in the engine opening or the container itself? Couldn’t you lose the straw in the engine? This is what one would classify as PTI (Poor Technical Instructions). On my part. You actually first just put the straw in the opening – in a mostly vertical position – and pour the oil on it. The exterior that is – and NOT actually IN IT. The oil will follow the straw downward in a pleasing manner. And if one has not reached the confidence level to feel that they can accomplish this without the straw slipping into the engine – I would recommend that they leave this for the experts. 2. If Hoobastank can make work, why not? 3. I have one:). Even add video to mine, but that’s part of the job. 3. I have learned a lot from yours! 1. The 3-toed sloth. When in doubt, fear or danger, I take a nap. Works every time. 3. Lack of focus + ever-increasing demand from client work. I can hear you now, Michael, “All you have to do, Steve, is increase those prices. This will give you elbow room to generate regular newsletters. This will attract higher quality clients and there you have it – the perfect virtuous marketing circle!” Goodness Michael – you talk such sense. Anyway – a revolutionary new approach to email marketing starts next week. Watch this space! Looking forward to your new approach, Sloth. I mean Steve! Loved the newsletter today and just wanted to let you know that it made it into my “Seth Godin” folder. As a solopreneur, I’ve had my share of unmotivated, uninspired, “I’d rather be working at a McDonald’ drive-thru window” days. When this happens, I open the Seth Godin folder to find inspiration. I’ve been in business for 10 years and there are less than 100 emails from various folks in that folder – so I wanted to let you know that your words made a difference today! Thanks Christian! I appreciate being held in such good company. Great topic wrapped in an awesome story! Wonderful job, as always. Glad it was useful, Cynthia! 1. Probably miniature poodle — small, cute, but useless and likely to panic. 2. I suppose. I try to turn things into poem titles, but couldn’t manage this one. 3. Other than the fact that I don’t have an email list and technology scares me, it’s definitely what you just said. I have plenty of ideas and opinions, but not much special knowledge to share. Would you count how to properly use semicolons(to separate two independent clauses), or obscure words and facts, such as this: there is no such thing as herbal ‘tea,’ because it’s not made from the camellia sinensis plant — Actually herbal ‘teas’ are called “tisanes”? Thanks for this great reminder. It will take some thinking, but maybe I do have something to share. I’m sure you do; I’m never sure how to properly use semicolons, for example; like this; alright, I’ll stop. Love that you’re writing about it – and in your oh-so-appealing (and I mean that seriously) style. Why – I was just thinking about this myself!! In fact I wrote a post about it: “What’s the most powerful thing you learned as a child? Could you teach it?” ( https://www.hipharp.com/blog/25988 ) — NOW I’m thinking it should have been called – what’s the simplest, most self-evident thing you learned as a child? And how did it change your life? Thanks so much for this post, Michael. I love how you always show me a larger context – and where it fits.